As reported by TruePublica the day after Donald Trump withdrew from the Iran nuclear deal that took EU/US negotiators 12 years to broker, we had a strong suspicion that the EU would this time draw a red line in the sand after America scuppered the Paris climate deal, TTIP and other agreements. This was the last straw. We reported yesterday that Europe was setting up a system to trade Iranian oil with Euros and ‘ditch the dollar’ and we reported on several occasions before that, that a 1996 ‘blocking statute’ may be resurrected from the last time America was bullying the EU over Iran. Juncker said that the new law would be launched Friday morning at 10:30 a.m. local time (0730 GMT). We also predicted that European banks would be given the green light to facilitate trade transactions to ensure a smooth process for European corporations. This then stops USDollar trades and protects them from prosecution by US authorities. We said this red line in the sand is an important one for more than just trade reasons. The US and EU have been interacting for more than sixty years. US-EU relations officially started in 1953 when US ambassadors visited the European Coal and Steel Community, which ended up being the beginnings of the Union as we know it today. The two parties shared a good relationship, strengthened predominantly by cooperation on trade, military defence and shared values. What we have seen in recent years, especially since Donald Trump’s arrival at the Whitehouse is a new trade war, not just over Iran but tariffs and import quotas, an argument over military expenditure at a time that the EU is building its own army and an emerging discord of shared values over many issues ranging from climate change, agriculture, pharmaceuticals, the Israel embassy, Palestinian massacre, Mid-East foreign policy and so on. Even the so-called ‘special relationship’ with Britain is under strain. It is too much of a leap as yet to state that the European Union is prepared to make a full stand against America with the 27 nation bloc protecting Iranian oil imports against the will of America for yet another regime change strategy. However, one has to wonder if the EU is pivoting slightly towards more lucrative emerging markets in the East in doing so. After all, Iran has both Russia and China as allies. Will geopolitical allegiances start to change shape in the Mid-East and if so, one wonders by how much. This will take years to play out but I still say, Iran was the moment the EU punched back. 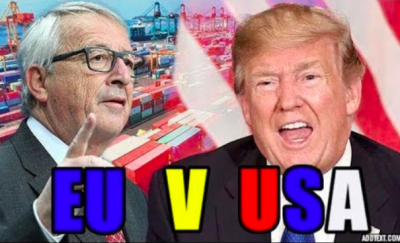 Another confirmation that US/EU relations are under considerable strain came from European Council President Donald Tusk who fully derided Donald Trump over his administration’s “capricious assertiveness” and called on the EU to unite on the Iran nuclear agreement and tariffs. Speaking at a Western Balkans summit in Sofia, Bulgaria on Wednesday, Tusk was in no mood to hold back in his assessment of the US.